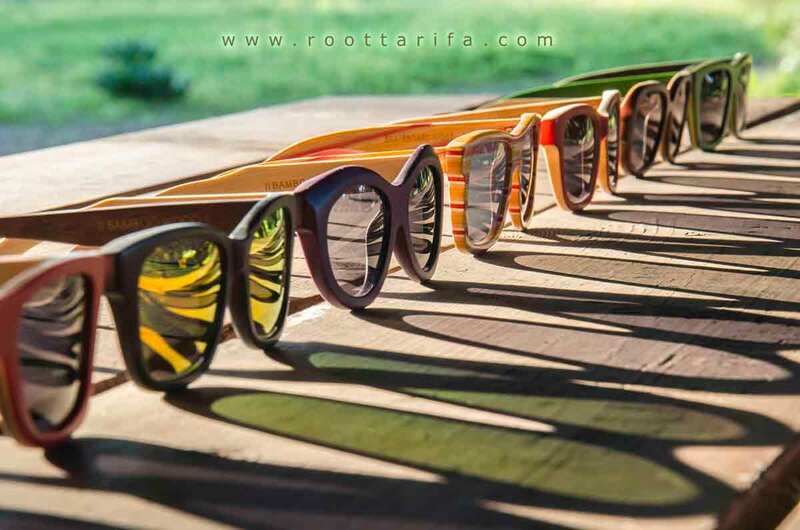 In this article we explain in detail how to care for and maintain your Root sunglasses from natural wood. Wood is a material of organic origin very light so our sunglasses float. It is not recommended nor are they intended to remain in contact with water for long periods of time but are resistant to rain and water and you will have no problem getting them wet, in fact recommend removing grit and abrasives from lenses with water (see below). Our glasses are composed of several elements in an array such as frame pins, connecting elements between the two (the hinges) and lenses. Our frames and legs are made from hand of a single block of natural wood, which is treated with natural dyes (sometimes colored or colorless depending on models and wood) to nourish and protect the wood from external agents and retaining their properties and natural beauty for a long time, so it is not required special care, however if you are one of those very careful and retailers persons from time to time can be applied to wood a very thin layer of natural wax applied with a clean cloth or with an ear bud for areas where fingers do not come with the cloth. In this way you will keep your glasses as the first day for much longer. The hardware (hinges) of our sunglasses are made of stainless steel high quality and do not require special care, they are fixed to frames and temples with small screws standard head, if after time notes that pin dances a little, you just have to tighten the screws with a small destronillador jewelry available at any price multi store and return to your site. The lenses are the most sensitive element sunglasses. Our TAC UV400 lenses (100% UV protection) 1.2mm thick are Tinted allowing you to enjoy a vision with less glare and vibrant colors. With your glasses natural wood Root receive an appropriate suede microfiber cleaning both lenses neutral colors (brown and gray) as mirror lenses and a jute bag to protect your sunglasses when not in use. In urban environments you can PLS suede microfiber cleaning lenses gently rubbing both sides. If you've been on the beach or in dusty environments, we recommend first put the lenses under running water or submerge and stir in the lavavo to remove grains of sand or dust are abrasive and will scratch your lenses by rubbing with chamois . Scratches in a neutral lens (gray or brown) is Clamente displayed as a line or a point in a lighter color than the lens itself in mirror lenses these scratches and chips will be shown as a black dot or line that can be confused with a speck of dust or stain, rub repeatedly in any case (applying the nail for example) because in these lenses only get remove the mirrored lens cover exacerbating the problem. In Root offer aftermarket repair and replacement eyeglass lens Root. If you need to change the lenses of your glasses ROOT, you can contact us at the contact details further down and out about prices and next steps.